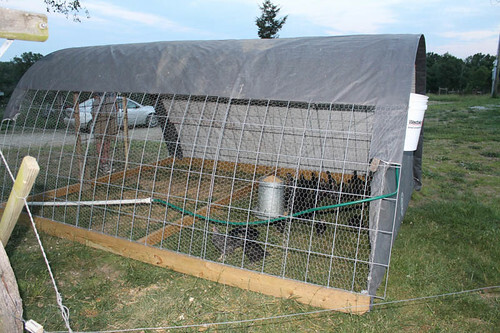 As you may remember from earlier the little broiler chicks are now in their new field pen. Unfortunately, something has paid them a visit during the past few evenings. I’m down one chick and two turkey poults. That really irks me because the turkey poults were nearly $7 each. 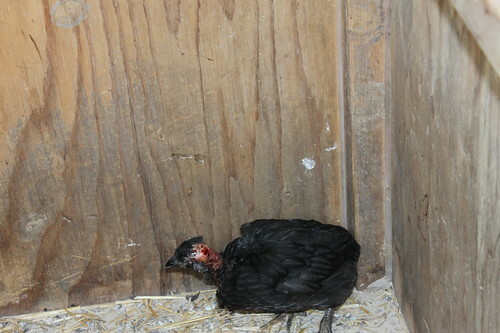 We did have one chick that survived an attack. It looks as if they were sleeping all smashed up in the corners of the pen. Being as some of them are still pretty small, they could get some of their body out from under the cross-member board with all that pushing and shoving. 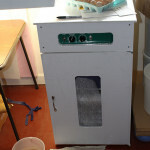 We’ll keep this lucky little guy on his own for a while, so the others don’t pick on his scalped little head. He can go back in with the others in a week or so, maybe with a bit of duct tape over his neck. 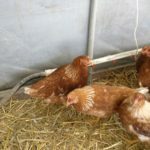 We’ve used duct tape before to keep laying hens from getting too torn up by our big red rooster and it works remarkably well. We’ll soon see how it holds up on a growing chick like this. 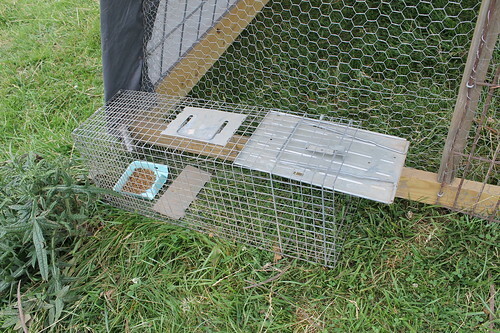 Anyway, the broiler pen now has a nice new accessory, the live-trap. Racoons and skunks both like a little cat food. All of this makes me want a motion-sensing IR WiFi Webcam to put out by the pen. That way any commotion could be checked out in the wee hours without so much as getting out of bed.